The Virginia State Quarter was released on October 16, 2000. It was the fifth state quarter released in the year 2000 and the tenth in the series which was authorized by the 50 States Commemorative Coin Program Act. 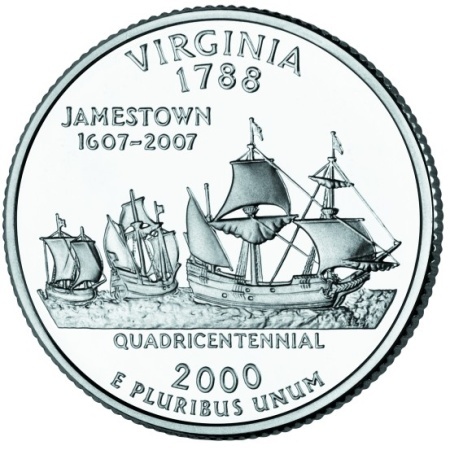 The design of the VA State Quarter is themed the Jamestown Quadricentennial in honor of the 400th anniversary of the founding of Jamestown, the first permanent English settlement in America. These first settlers, consisting of 104 men and boys, departed from London on December 20, 1606 and arrived at a small island along the James River on May 12, 1607. Here they established their new settlement, naming it Jamestown in honor of King James I. The images depicted on the Virginia State Quarter are of the Susan Constant, Godspeed, and Discovery, the three ships that brought the settlers to the new world. 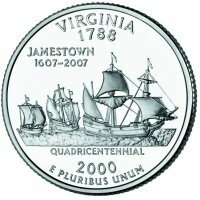 Ideas for Virginia's quarter design came from colleges, universities, museums, and state agencies. The design concepts submitted were then reviewed by representatives from the Library of Virginia, the Department of Historic Resources, the Virginia Tourism Corporation and the Department of General Services before a final design concept was chosen by the governor and submitted to the Secretary of the Treasury for final approval. Below is a table showing the design specifications and mintages of the Virginia State Quarter. Note: The modification moved some of the wording from the reverse to the obverse to leave the reverse available for the state's design. Reverse - Each state theme was proposed, and approved, by the governor of the state. Final design was created by Edgar Z. Steever. His initials appear on the right side of the coin just below the largest ship.